The Daniel Defense Detachable AR-15 Front Sight incorporates an unobtrusive, snag-resistant profile with innovative design elements that facilitate the use of a forward-mounted, compact tactical light. The one-piece sight is machined from 6061-T6 Aluminum with a Mil-Spec Type III Hard Coat Anodized Finish, and easily secures to a Picatinny-Spec Rail with a slotted screw that is threaded into a self-locking steel insert. The front sight's body features a concave radius on either side, providing a natural shelf to rest a thumb for activation of a forward-mounted, compact weapon-light. 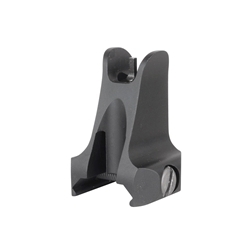 The sight is optimized for use on a handguard or gas block rail that is located on the same plane as the receiver top rail. Uses standard AR-15 front sight posts and is adjustable for elevation using a standard A2 front sight tool (not included).